The first club TT of the season took place this evening in freezing temperatures on the Dublin road. There wasn’t many skin suits to be seen as the strong winds and snow meant you had to wrap up warm. All things considered, there was a fine turn out of 19 hardy men and women for the first race and many strong early season performances were put in on this short 6 mile course. It was great to see 7 new faces on the start line and plenty of old ones too. Shane Scully put in the fastest men’s time while Sinnead Oakes put in the fastest women’s time. Your times for the first TT are never that important. You will find that as you keep doing them your times will drop considerably. The key is to keep turning up to the races and be consistent with your training. Before you know it you will be mixing it with the best! Next up: Chain gang cycling (fast rolling over) on Thursday at 6:00pm starting at the Five Alley Pub (Limerick Road). Next TT: We will be back on the old courses from last year next Tuesday as the clocks will have gone back. Start will be 6:15pm at the hospital (side car park). There will be a choice of route – 10 mile / 14 mile / 19 mile. These races are open to everyone and are suitable for all abilities. Refunds for anyone pulling out of the North Tipp Sprint will not be available after March 31st. Bike Training: The club are going to start evening cycling this week. These are not to be missed if you are serious about improving your biking ability. Once the clocks change next week we will have a bit more time to play around with. All are welcome. Tuesday, March 26th – 10km time trial – This will start at 6:00pm sharp from the pool. The route will be out the Dublin Road to the first roundabout and back. People will be let off in one minute intervals. Take it as hard or as easy as you like for the first one. The important thing is that you turn up and get used to time trialing. There will be a group leaving from the pool at 5:00pm to go on a warm-up cycle. Thursday, March 28th – 17 Mile Chain Gang Cycling – this will start at 6:00pm sharp from the Five Alley Pub on the Limerick Road N7. The route takes you to Birdhill and back. Cyclists will be put into ability based bunches and handicap times will be given. It is advisable to warm-up before this. Saturday Club Cycle – There is no scheduled club cycle this Saturday, we reckon you deserve the bank holiday off, but keep in mind that the following weekend is the final Dromineer Duathlon race!! Run Training: Tonight’s run will be at 6:30 as normal, but as of Monday the 1st April this will be beginning at 6pm. It is not a track session, its a long run that is either 3, 5, 7 or 10 miles long. Fridays run will be a track session and will start at 6pm. SIAB Schools Cross Country International: Darren Dunne and Killian Cullagh were in Wales representing Ireland over the weekend. Both lads did the club proud with Darren finishing in 17th place and Killian in 31st. This is a fantastic achievement for the lads so make sure to congratulate them! Ennis Duathlon: Sinnead Oakes secured a prize for the 2nd week in a row with an excellent 2nd place in the Ennis duathlon on Sunday. The distances were: 2.7k run / 16.85k cycle / 2.4k run. Bike Racing: The club had representatives at two races this weekend. First up was the Lucan GP with Kevin Sherlock, Gary and Shane taking part. The lads were competitive throughout but no points were scored on the day. Next up was the first big race of the season in Carlow. The Des Hanlon Memorial is a tough race with a huge sign-on. Most of our bike racing team managed to free up their calendar so as to attend this (the usual excuses were given by the usual suspects!). The best result for the club came in the A4 race where Kevin Moyles came home in 2nd place and with that earned promotion up to the A3 category for future races. Well done Kevin! Kenneth Kennedy finished just outside the top 10 and Hugh Flannery punctured out early. Eoin Woolley also took part and battled hard to finish this very tough race. In the A3 race, Gary Scully punctured out in the exact same spot as Hugh. Shane got himself into an early breakaway that stayed clear up to the 45 mile mark but they were caught. In the end, Shane finished around 15th. Eamon Hartnett came home soon after in the bunch. Next up: Rás Chonemara 3 day stage race = rest week for most. Club Table Quiz: The club would like to thank everyone that came to support the club on Friday night in Rockys. Thanks also go to Cliodhna McGrath and Mary Donnellan for their work organising it. Plenty of money was raised for the club so the committee can go on their fact finding mission to Hawaii next year. Weekend training: As the table quiz is on this evening there will be no track session. The cycle route for tomorrow morning will be Nenagh to Borris-in-Ossory and return as we anticipate a few sore heads! Turbo Training: is finished for the season so there will be no turbo training this week. The club will be organising some tough as nails Tuesday and Thursday evening cycles as soon as the clocks change at the end of this month. The running complex will still be opened on Thursday if you need to call in to collect your turbo. Please don’t leave your turbo in the storage area for the next 6 months! Club Table Quiz: The next big club event on the calendar is the club table quiz on Friday, March 22nd in Rockys. Please show your support by turning up with a team in tow. Cullagh & Dunne to represent Ireland: Killian Cullagh (Nenagh Vocational School) & Darren Dunne (St. Joseph’s, Borrisoleigh) will represent their schools & Ireland at the SIAB Schools Cross Country International in Wales on Saturday 23rd March. Both boys are Tipperary’s only representatives having finished 8th & 9th in the Intermediate race at the recent AVIVA All-Ireland Schools Cross Country. Good luck to both boys who don the Irish singlet for the first time. Borrisokane 10km: Well done to Eoin Woolley, Eddie Tucker, Sinnead Oakes, Majella Moyles and Úna O’Doherty at the Borrisokane 10km. Sinnead claimed a prize for 4th place woman overall in a time of 44:37. Keeper Challenge: Well done to Benny Delaney and Donnchadh Floyd for completing the tough Keeper Challenge last week. Bike Racing Team: Just 4 of our team were in racing action last weekend. Shane, Gary, Kevin M and Kenneth took part in the Carrick Wheelers Cup on Sunday but didn’t come away with any points. Each of the lads finished in the main bunch with Kenneth coming the closest to scoring, finishing just outside the top 10. The excuses for team members missing races are coming in thick and fast nowadays, so you better get your excuse in early for next week. If someone needs a spare excuse then there are a few leftover for this week – I have to take my aunt to Lourdes, I have food poisoning, I don’t race on the sabbath day, it’s my birthday and I am going to Jump N Gyms. As usual send all excuses to the following email address i-am-weak-mentally-and-physically-weak@clubexcuses.com. Next up: is the Des Hanlon race in Carlow. This would be considered to be one of the top races on the calender and it should be a race that everyone targets. Text 0872605743 to book. For club members only. The club have re-organised the table quiz for Friday the 22nd of March. Everyone’s support would be greatly appreciated. Start practicing your dingbats now!! Aviva Irish Schools’ XC Champs: Killian Cullagh and Darren Dunne represented the club and their schools at the recent All Ireland cross country event up in Belfast. Both lads were in the intermediate boys race and both performed extremely well. Killian finished in 8th place with Darren one position behind in 9th. This fine result means that both lads have qualified to represent Ireland in two weeks time in Wales. This is a fine achievement and is the result of plenty of hard training over the last few months and years. 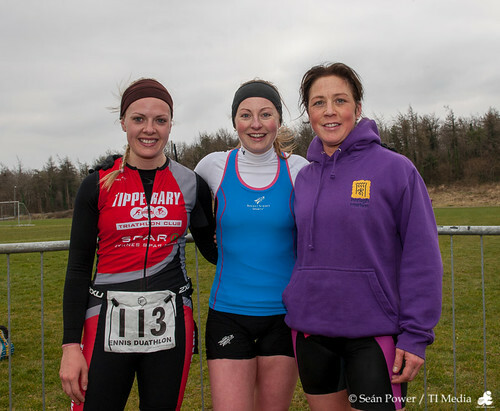 Fastnet Duathlon, Schull: Congratulations to Sinnead Oakes for coming home in 2nd place in the women’s race. The race distance were 5km run, 16 Km cycle, and 3km run and Sinnead finished 29th overall. Saturday Cycle Speed: Warning: The purpose of the Saturday morning spin is not to go as fast as you can and try to drop everyone. This is supposed to be a controlled cycle with speeds that suit new comers to the club. People are not supposed to be left behind. From now on the bunch is going to revert back to a controlled pace: target = between 17 – 18 mph on a flat course. If you find that this pace is too slow then organise your own cycle or go out with the club racing group. People who want to drive on the pace are not welcome at the triathlon club cycle. The bike racing group would be delighted to have ye. If for some reason bike racing team lads join up with the normal triathlon club cycle then you lads especially should not drive on the pace. This cycle is not for you. You are guests at their cycle and should follow their rules or don’t go at all. For any bike racing lads looking to drive on the pace then go to a race on Saturday instead and use up your energy there. Cycle as a group or don’t come cycling at all. Comprende?! Dromineer Duathlon Race 3: The 3rd race of our world renowned Dromineer Duathlon series takes place this Saturday, March 16th. These races have been very well attended so far and we hope to make this one the biggest yet. If you haven’t taken part in one so far then it’s about time you got up off your arse and did one! These races are ideal preparation for the triathlon season ahead. We hope to see ye all there. Bike Racing Team: Everyone on the bike racing team was in racing action over the weekend. First up was a race on Saturday in Clonard, Co. Meath. Kevin S, Andy, Gary and Shane went to this race. All 4 finished in the bunch but didn’t score points in the final bunch sprint. On Sunday, the team made the short trip into Caherconlish in Limerick. The race took place in terrible conditions with wind, rain and freezing temperatures making racing very hard. Eamon, Gary and Shane took part in the A3 race but had no luck on the day. Things were different in the A4 race where Kevin Moyles and Hugh Flannery both scored points for the club, thereby continuing the club’s fantastic run of form where points have been secured every weekend to date. Kevin Moyles got himself into a winning breakaway at the half way mark and pushed hard to the end to secure a 3rd place. Hugh Flannery finished in 5th as he finished strongly at the front of the chasing bunch. Well done to both lads. Keith, Andy, Kevin S, Kenneth and Mike B also took part in the race. Eoin Woolley and Sinnead Oakes were also in bike racing action representing the North Tipp Wheelers. Sinnead took part in her first ever bike race in Caherconlish while Eoin too part in the bike race in Loughrea. Well done to both. North Tipp Sprint Marshalls: Text Cliodhna 0872938847 if you can marshall at the North Tipp Sprint. Club members are expected to help out. Kilkee Accommodation: Text Mary 0863994584 if you want to book accommodation in Kilkee for the Hell of the West triathlon.